March 28, 2005. 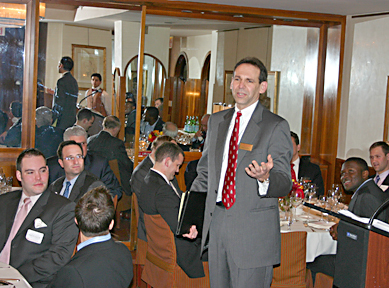 Fred Wilson ’69, Wabash Trustee, hosted Steve Klein, dean of Wabash Admissions, and over 25 area alumni for an alumni admissions discussion at a New York City restaurant. The evening was the largest alumni admissions training program in recent memory. The assembled group represented seven decades of Wabash graduates. Wilson opened the evening by asking for everyone’s help in introducing local high school students to Wabash. He then turned the evening’s program over to Dean Klein. Klein gave the group an update on the College before dinner. 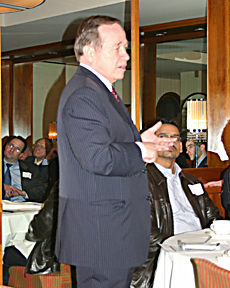 After dinner, Klein briefly explained the recruiting process and suggested that local alumni could help the College’s recruiting efforts in and around New York City best by referring young men of promise to the College. Klein divided the group into smaller segments then asked the groups to brainstorm developing referrals based upon each individual’s background and profession. Many alumni stayed after the formal program to exchange recruiting ideas. Many thanks go to Fred Wilson’69, who hosted the entire evening, and to Dean Steve Klein for his efforts in "Spreading the Fame".